A Target gift card would be totally awesome!! I would love to win this giftcard! Another WOW! giveaway…yay! me, me, ME!! Love this weeks giftcard. How cute! Hope Santa Mouse comes my way! Already do LIKE Totally Target!! Thanks for all your hard work, love your website! Like totally target on fb. Thanks so much. Love your website. Cool giveaway! Thanks for the chance. Merry Christmas Kerry! Thanks for your generosity. I like TT on fb under my Beverly S…. account. @Totally Target!! Thanks for all you do! Great giveaways! Thanks Totally Target! I love target and love giveaways! Thanks! I love $25. Thank you. 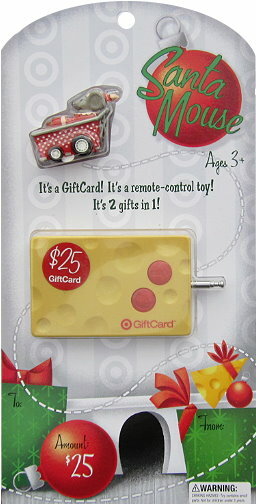 Gift card is sooooo, sooooooooo cute. Would love to win it. Thanks for all you do!!! fb is where I find all of your deals! Love these giveaways! I appreciate all your hard work too! Wow- these gift cards are too cute. Thanks!